Keegan on the cards? Mayo will be hoping that Lee Keegan will be back in harness for this weekend. Photo: Sportsfile. All roads lead to the Gaelic Grounds in Limerick tomorrow afternoon as Mayo look to get their championship campaign back on track. Twenty-seven days on from their elimination from the Connacht Championship by Galway, Stephen Rochford's men are hot favourites to book their place in the second round of the qualifiers - when the beaten provincial semi-finalists re-enter the championship. Limerick were well beaten by Clare in the Munster quarterfinal, with the Banner County running out 1-22 to 0-14 winners. That defeat came on the back of a very poor run of form in division four of the National Football League where Limerick finished in sixth place in the bottom rung of league football. They picked up just one win, against Waterford, along with a draw against London in their six league games. Rochford will be without the services of Tom Parsons (out for the rest of the season ) and Diarmuid O'Connor (suspended ) for tomorrow's encounter — but with the perceived gulf in class between the two sides - Mayo should not miss the the pair, this time around. The absence of these two key players will have given Stephen Rochford plenty of food for thought over the past few weeks — with Cillian O'Connor a nailed on certainty to return to the starting line-up, after completing his own return to action from injury against Galway as a sub. But replacing Parsons in the middle of the park is the one area where most attention will be paid. Parsons and Seamie O'Shea have formed a formidable partnership — with both men strong in very different areas. The Charlestown man used his engine to great effect, with his box-to-box style a key component of both Mayo's attacking and defensive platforms, while O'Shea is at his most effective between the two 45s in the congested middle third, doing a lot of grunt work. Stephen Coen is one option to put in there, but his style might be a bit too similar to O'Shea. 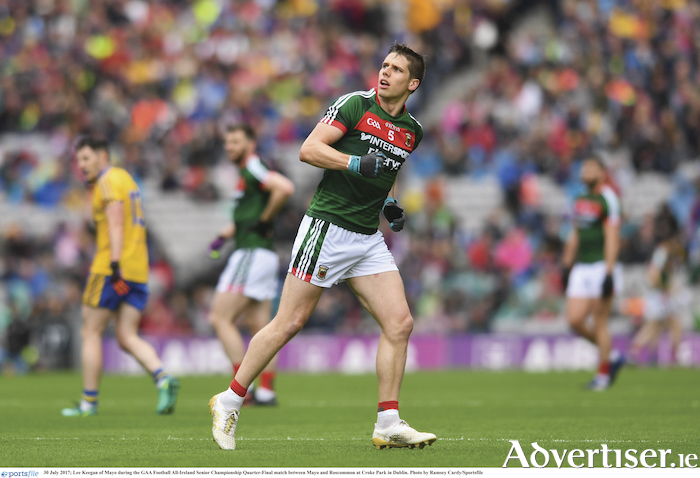 Barry Moran was on the bench for Mayo's clash with Galway — but he was not looked to by the management team during that game, it could be a good opportunity to give the Castlebar man some game time, as he is the most experienced of Mayo's midfield options in reserve. Lee Keegan is expected to get some game time tomorrow as he comes back from injury, the Westport man has the engine and the big game personality to relish a run in the middle of the park and could be a serious option here. Donal Vaughan is another man with the stamina and speed to provide the probing runs forward and the ability to get back and cover when needed, and the Castlebar Mitchels' import is well used to playing in this role. The one option that will probably excite a lot of Mayo supporters is the potential of playing Cian Hanley in the middle third. The Ballaghaderreen man who just returned to Ireland this year, after three years with Brisbane Lions in Australia, made his first senior appearance for Mayo against Galway, and this could be the perfect chance to see how quickly the returnee has got up to pace with the inter-county game. If Mayo get over tomorrow's game, they will face into round two of the qualifiers where they will face one of the beaten provincial semifinalists already in the hat, Sligo, Leitrim, Clare, Tipperary, and Monaghan. The other three beaten semifinalists will come from the losers of the meetings between Donegal and Down, Longford and Dublin, and Carlow and Laois. Round two of the qualifiers will be played on Saturday, June 23.